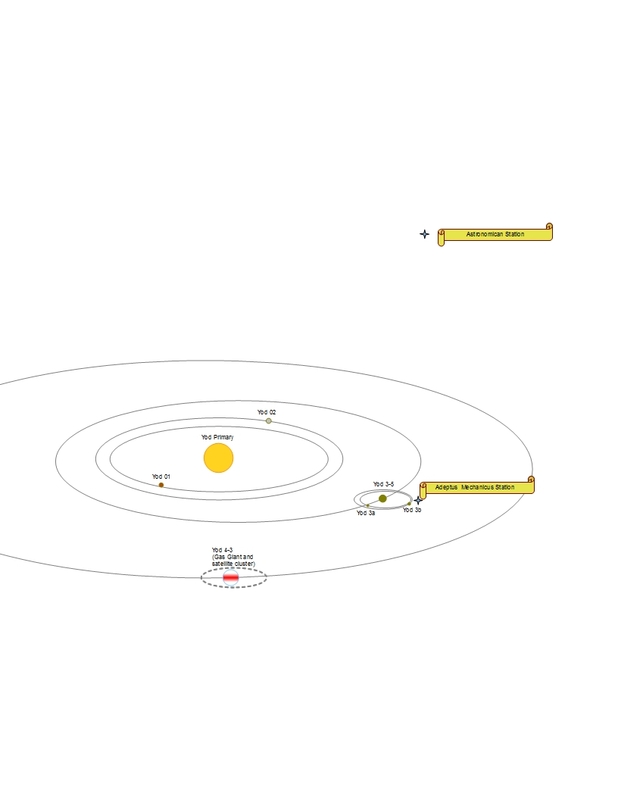 Location: The satellite Yod 3b, larger of two moons in the Yod system, Sector 3. In the near-total darkness of the small moon, designated Yod 3b, Squee, Creeper and One-Eyed Mik approached the ruined Observatory carefully. At least it looked like it had been an Observatory, maybe a hundred years ago. The three Ratlings easily mounted the ruined walls to peer through the scopes of their sniper rifles. Captain Craine, of the 9th Armored Cavalry, 437th Armageddon Steel Legion Regiment, was assigned to recon and capture “Crater 14” in Sector 3. Formerly the site of an Astra Scholastica, it was needed to set up a forward firing base before assaulting the Spaceport on Yod 3b. Something wasn’t right at the facility, no one was responding to Comms, but things were moving around and spacecraft were coming and going, if irregularly. After running into a small band of Chaos Marines while establishing their beachhead on Y3b Captain Craine wasn’t taking any chances of walking into a trap. 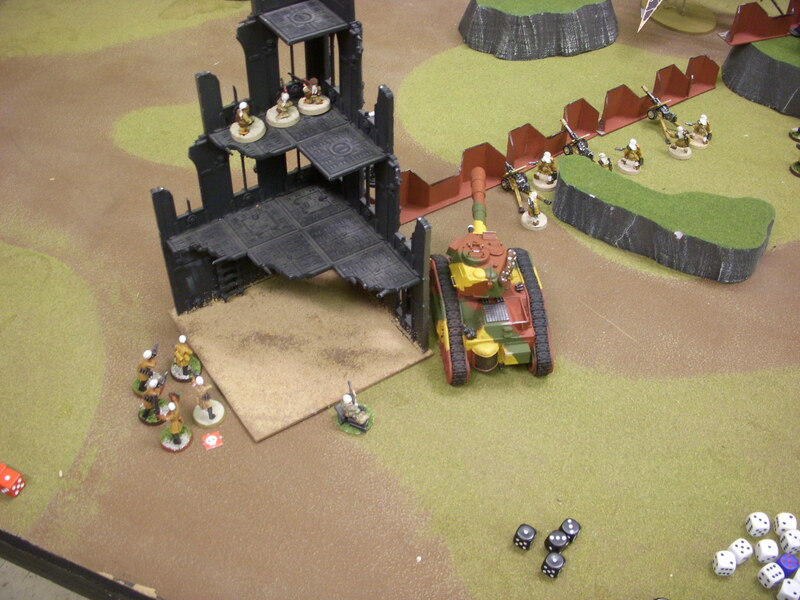 Early this morning, before the lunar dawn, Ratling Snipers scouting ahead discovered a detachment of Chaos Marines returning to a cache of supplies in the ruins of a hab unit. It appears that the heretics his Veterans dispatched earlier were only a scout force themselves, the van of a larger army. Since most of his expeditionary force was busy with preparations for the upcoming assault, Craine ordered Fraser to mount up and for Lt Thomm to round up his platoon to investigate what Squee had called in. 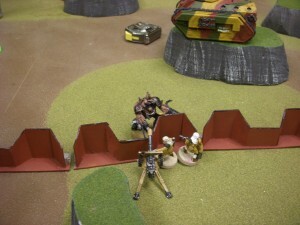 Thomm’s platoon had that Vanqusher attached, a big gun like that may come in handy. 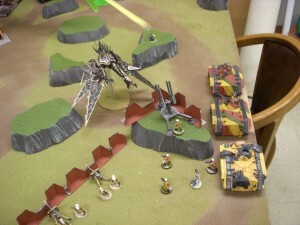 Within a span Craine had his dragoons on site, working with practiced efficiency to set up an Aegis Defense line, while his own Command squad set up the autocannons of the Quad Gun. 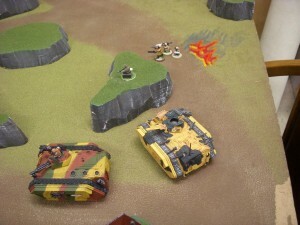 Further recon by the Ratlings indicated these heretics were rather lightly equipped, only the two Rhinos, and quite battle-scarred, indicating recent fighting. 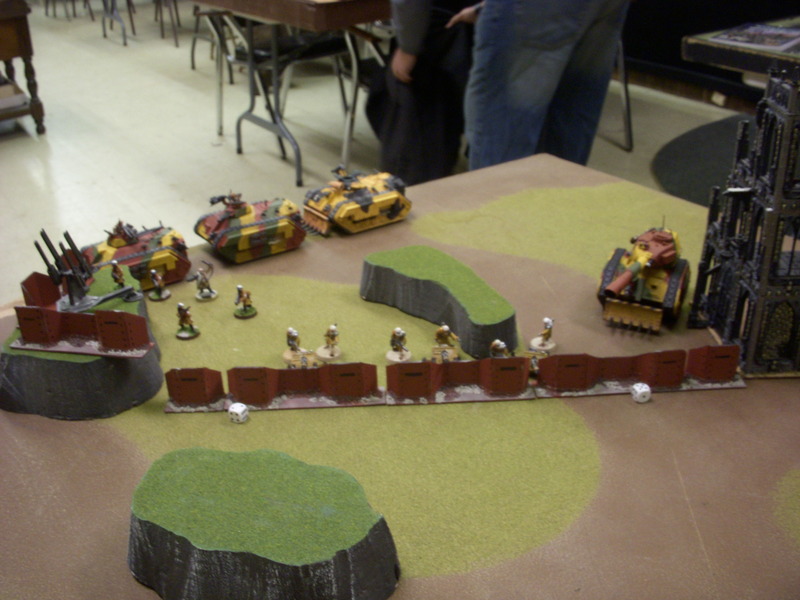 Craine called for Thomm’s dragoons to prepare for an assault on the heretics to the north. 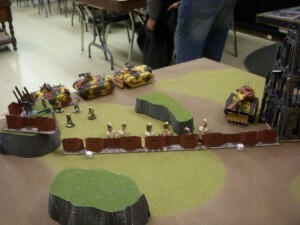 The veterans of 78th Fraser Highlanders mounted in their Chimera, going west around the crater, to make a flank attack. Minutes before the sun appeared over the horizon, the four Chimeras moved out. In the near darkness Fraser’s operators drove straight into a fusillade of Lazcannon fire from a squad of Obliterators, hidden just over the lip of the crater (image 01.001b). 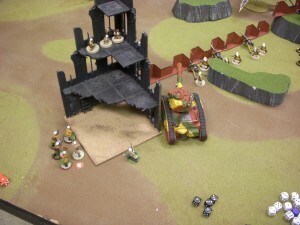 The vehicle torn to shreds, the surviving members of the squad took cover in the shadow of a ruined observatory tower. Sgt Thomm’s Dragoons, mounted in a trio of Chimeras, moved out to the east, around the edge of the crater. As the sun rose into the sky a Helldrake came screaming over the horizon – bearing down on Craine’s command squad like an arrow from Hell (image 02.001.01). The interceptor function of the QG worked perfectly, the torrent of fire from the four guns stunning the beast/machine. As the Helldrake ripped the sky overhead, the pair of rhinos launched their own weapons, providing cover for the advancing Obliterators. 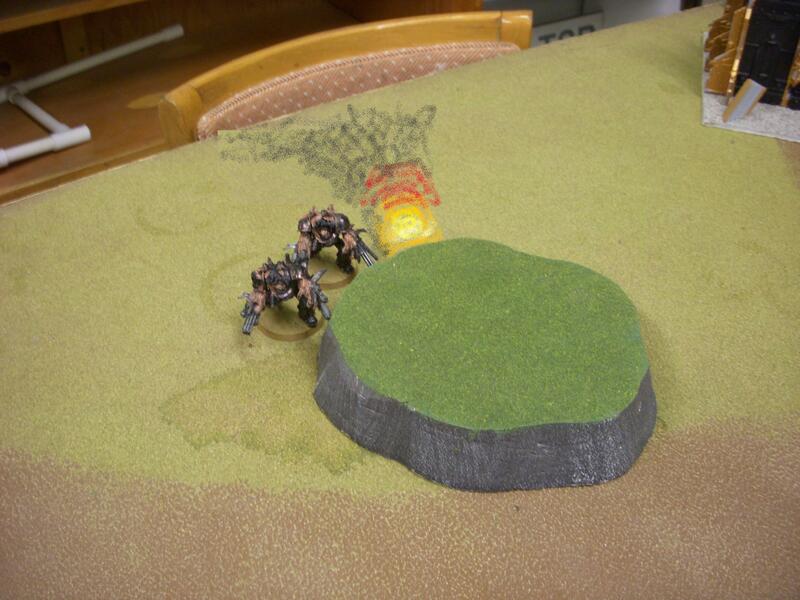 The first flight of Havoc missiles flashed across the crater to explode harmlessly against one of Thomm’s Chimeras, while a second volley impacted the Aegis line. Molten metal from its warhead holed the pressure suit of one trooper in the lazcannon HWS, but the rest grit their teeth and prepared to return fire. 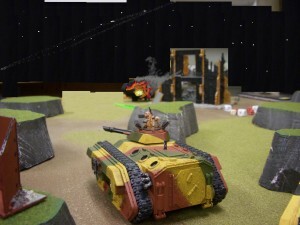 The command squad, Lazcannons and the nearby Chimeras turned their guns skyward in response to Capt Craine’s order to “Bring it down”! A second blaze of fire flashed into it’s armored hide and the daemonic creature was blasted from the sky. The only casualty from the nearly-deadly encounter was from an exploding plasma gun that just got too hot (image 02.001.01b). Thomm’s Dragoons continued eastward, opened fire on the Rhino nearest the ruins and blasted it’s hull open with multi-laser fire (image 03.001b). 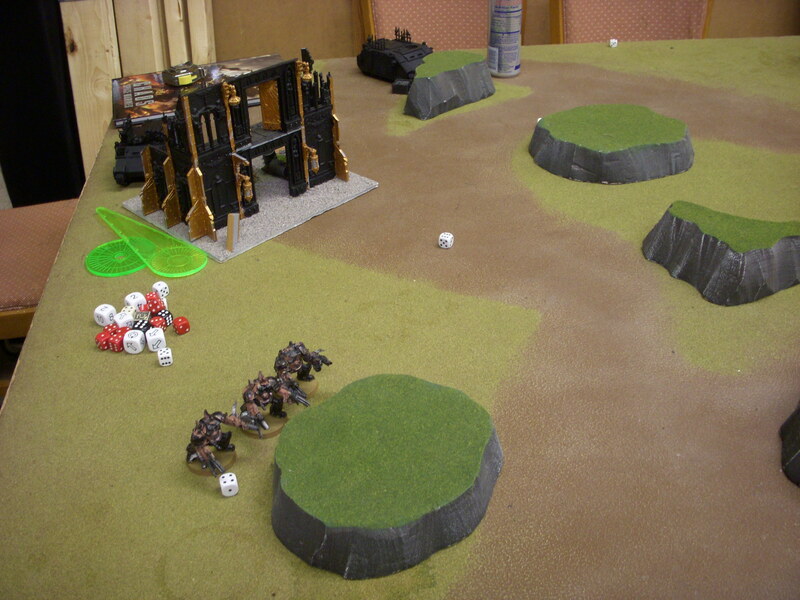 The Aegis Defense line proved its worth as the remaining Obliterators blasted away with plasma cannons. On the Eastern flank the heretics in the Rhino fired upon the approaching Chimeras, while the Havoc missiles were ineffetive a powerful Lazcannon beam sliced through the Chimera’s armor, causing a dramatic explosion. Nearly all of the troopers inside were slain, yet the surviving Seergeant managed to pull his heavy weapon team to safety (image 04.001.01b). 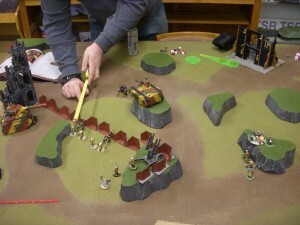 As the lone remaining Obliterator advanced on the guardsmen’s fortified position, Captain Craine ordered all weapons to be trained upon it. In an amazing show of invincibility it marched through the storm of fire, shrugging off even a direct hit from the Vanquisher (image 04.001.02)! Lt Thomm disembarked from his Command Chimera to assist the surviving infantry squad in securing the ridge at Crater 14, sending the track on to attack the heretics in the remaining Rhino (image 05.002.01). No one seemed to know what was happening in the ruined hab unit, as the corrupted marines in that building could not be seen. Their nefarious activities were at the back of Captain Craine’s mind at the moment, as the last Obliterator was smashing into the Aegis wall and rending the Lazcannon team into unrecognizable shreds (image 05.001.01). 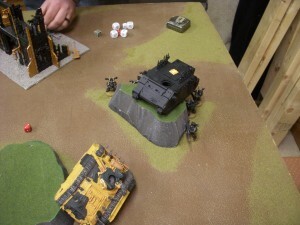 As the lumbering beast clambered over the Aegis wall and into the compound, Fraser’s veterans were at last able to focus their meltaguns on the monstrosity. The combined firepower was too great, even for it’s nearly impregnable armor. The meltas were able to do what even the Vanquisher had not, and brought low the amorphous creature.